Looking ahead into next weekend, it appears we’ve got good weather on the horizon. Now is a great time to get your bike serviced…we’ve got quick turn around times. New tandems are arriving regularly. We can also get you what we don’t currently have in stock…don’t wait for lead times to creep up on you! Also, all in-stock Kask helmets and Knog lights are 50% off!! Just mention you saw it on tandemcycleworks.com. At Tandem Cycle Works, we love to ride tandems and to share this experience with others. 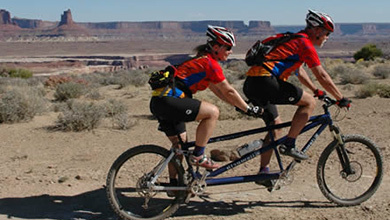 To us, riding tandem is the very best way to enjoy cycling together. Tandem riders are a team of two and sharing the pleasure of cycling on the same bike is an awesome team-building experience. Not only do tandem teams get fit together, they share the intangible feeling of camaraderie that makes cycling twice as much fun! When you see couples on tandems, doesn’t it bring a smile to your face? You are curious about their bike and may even stop to ask them about tandem riding. There’s just something charming about tandem bikes! While couples enjoy riding tandem, our bikes provide family fun to all ages. Perhaps most special of all, tandems give many individuals with disabilities or illnesses the chance to ride and enjoy cycling that is not otherwise possible. Tandems truly fit a unique role in the bicycle world and at Tandem Cycle Works it’s our focus. You won’t find many, if any, tandems in “big box” bike shops. And forget about tandem selection in small shops! Should you be lucky enough to find a shop that has a tandem or two in stock, the selection is limited and the staff knows little about the bike — let alone all the newest, innovative options available. These shops are always happy to order you a tandem, but you must buy before you try. Stay up-to-date with events at Tandem Cycle Works! We had a better idea. Eighteen years ago we decided to create a shop dedicated to only tandems where the staff are experts, the store has MANY tandems in stock, and you can actually test ride the bikes before you decide to buy! Today, most consumers do their research on the internet. That’s probably how you found us. Or from one of our thousands of happy customers. In today’s world we are still unique among shops in our dedication to only tandem bikes. While you may not live close to Tandem Cycle Works, we regularly provide our expertise to customers around the globe who cannot find reliable and current tandem information at home. The internet has allowed customers from all over the world to find us! So even if you cannot visit us, we can still “talk tandems.” We ship anywhere in the US and it’s great fun for us to have our tandem bikes live in other states and even foreign lands! Tandems Are What We Do. Whether you are veteran tandem riders or new tandem cyclists looking for your very first tandem bike, we invite you to learn all about tandems here at Tandem Cycle Works. Guided by our experience, the best tandem builders on earth, and our customers over the past 20 years, we look forward to sharing our knowledge and expertise with you.